U.S. District Court Judge Lucy Koh on Friday ruled against Apple's request to sanction Samsung for sending previously-excluded evidence to the media and warned further "theatrics or sideshows" would not be tolerated. Before the Apple v. Samsung trial got underway on Friday, Judge Koh handed down her decision and brought jurors in one at a time asking each if they had seen or heard anything of the evidence leak. According to CNet, most of the jury didn't know about the events which took place during court proceedings on Tuesday, though one juror did mention he read a headline regarding the "kitchen table" comments made during the testimony of Apple witness Christopher Stringer but hadn't read the story. The juror said he could remain impartial in light of the news piece. The jury was again instructed to not read media accounts regarding the trial as slanted reports could foster impartiality. Bloomberg notes Judge Koh did, however, recognize the interest some jurors may have in outside reports, assuring them the Court was taking measures to keep them in the loop post-trial. 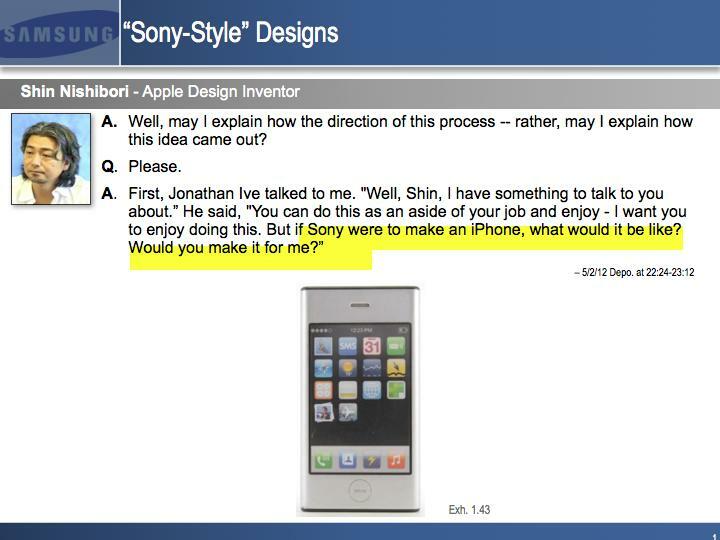 Reports came out Tuesday of an email Samsung sent out to the media containing demonstrative slides with text of a deposition from former Apple designer Shin Nishibori regarding a "Sony style" iPhone after the Court ruled the evidence would be excluded from the proceedings. Along with the slide, Samsung issued a statement which asserted the "excluded evidence would have established beyond doubt that Samsung did not copy the iPhone design. Fundamental fairness requires that the jury decide the case based on all the evidence." On Wednesday Apple countered with a request to punish Samsung's attorneys for what it called "egregious" misconduct meant to sway jury opinion. An official request for sanction was subsequently filed on Thursday asking the Court rule in favor of Apple's claim that Samsung infringes on iPhone patents. In response, Samsung counsel John Quinn rebuked Apple's claims and said he was operating fully within the open trial guidelines set by the Court. The rebuttal to the proposed sanctions also filed on Thursday, said "Apple's request is an affront to the integrity of the jury." He went on to call Apple's proposed order "frivolous at every level." While the out-of-court antics caused quite a kerfuffle, Judge Koh was also concerned that in-court filings were getting out of hand. "Some of these objections are ridiculous, they're five paragraphs long," Judge Koh said. "If you're going to do that messy objection, you're going to do it in front of the jury, and the time clock is going to be ticking." Before Friday's testimonies began, Judge Koh gave a final verbal warning to both parties saying the Court would not allow for grandstanding. "I will not let any theatrics or sideshows distract us from what we're here to do, which is to fairly and timely decide this case," she said.